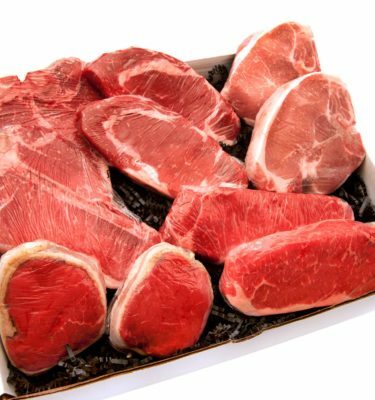 Beef, Poultry, Ham, fully prepared meals and sides. available for all your needs! Make it special with our catering options. From our unique butcher shop & catering services to even grabbing a quick meal on the go, we offer it all! Our knowledgeable & friendly staff is here to ensure your meal is so delicious that it’s the star of the party! Perfect shop for lunch, dinner or a quick delicious meal on the go. Our story starts in 1945 with Herb Kenrick, a rolling meat market that serviced the south St. Louis area with fresh meats. A year ago my mother in law had her Achilles tendon operated on and was in a cast for Christmas. My husband and I surprised the whole family with catered food from Kenrick’s. It was one of the best Christmases because no one was in the kitchen cooking. Sneaking away some of the roast beef au just before my daughter’s graduation party so I’d have a ‘leftover’ sandwich after the party. Smart thinking, it’s always the first to go. A co-worker prepared steaks for our division at work as a Christmas gift. 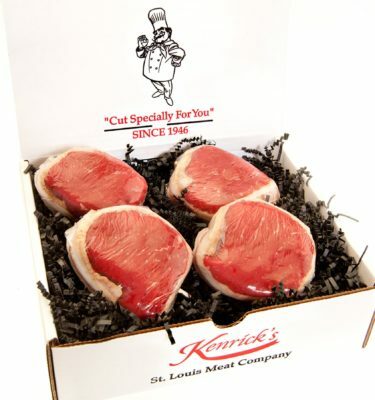 I must admit those Kenrick’s steaks were the best gift I’ve received in years. We had to really plead with her before she would tell anyone where she purchased those mouth watering steaks. When I found out I accessed your website and found out that you guys also provide catering for a luau. Way to go Kenrick’s – my family and I look forward to doing business with you. You guys are great! Browsing the case to see what new goodies you have for us. We love the grillers, but the pork tenderloin stuffed with pepper jack cheese, wrapped with bacon is to die for! The first time I walked in I felt like I was home. Growing up my mom was a butcher in a place just like Kenrick’s. When I walked to the meat counter all the gentlemen were polite and eager to help. The topper was giving my little girl a cookie. I wish I had a camera. It was like going back to great memories when I was a little girl. Thank you for being you. Kenrick’s wrapped up a pound of landjaeger for my husband. He was in Afghanistan and Iraq for a few years, so he really enjoyed it. The workers never complained or fussed when asked to vacuum pack those bits of meat. He loved those boxes I sent. We still go back and get that landjaeger. The first moment I stepped in the doors. I grew up in the country with small butchers that still somehow had a huge variety of things in their stores. I always loved going and when I moved to St. Louis I thought my friendly butcher days were over. I walked into Kenrick’s one day and as soon as the smell hit me I got excited. I’m constantly amazed at how much variety there is, no matter what I need be it pork brains, tuna steaks or some obscure cut of beef I didn’t know existed until this morning, it’s always there and with someone friendly to help me find it. Going to Kenrick’s with my grandfather and him ordering ‘just a few things’ and taking a ton of the deli clerks time. Also asking a million questions, sometimes the same questions. They sometimes tease him and he teases them. He loves going there. 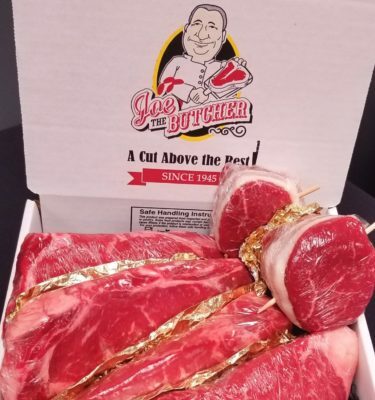 For Father’s Day we bought a ton of ribeyes and I came close to eating myself sick. They were so good I couldn’t stop! The texture of your steaks is incredible. My fiance brought me there for the first time this year and I was so amazed by the selection of products…. The Ozark Grillers were very good! Ever since we haven’t bought meat from anywhere else! My first visit there I thought there was so much to choose from. There are no meat markets on this side of the river that compare to yours! I asked the other shoppers that day, “what was good?” Everyone had the same answer, “it’s all good.” They weren’t kidding! I left with a Party Pack, filet mignon, meatloaf and the highly recommended seasoned baked potatoes! It was all excellent. I make a special trip just to load up on Kenrick’s meats. See you soon! I am a new-bee to Kenrick’s. I was amazed by the selection and wished you guys were closer to me. Love my first experience. Loved the food – the homemade potato chips, the landjaeger, delicious sandwiches and steaks…. I will keep coming back for sure! My husband informed me we were having company over and I called Kenrick’s to see if they had any crown pork roast. They didn’t but they said they would make me up one and it was made and waiting for me when I arrived. Walking back to the meat counter and being greeted by name and a smile – it was just like being on the old program Cheers!